1. We recently moved our rocking chair (aka Willie's favorite chair) on the porch. 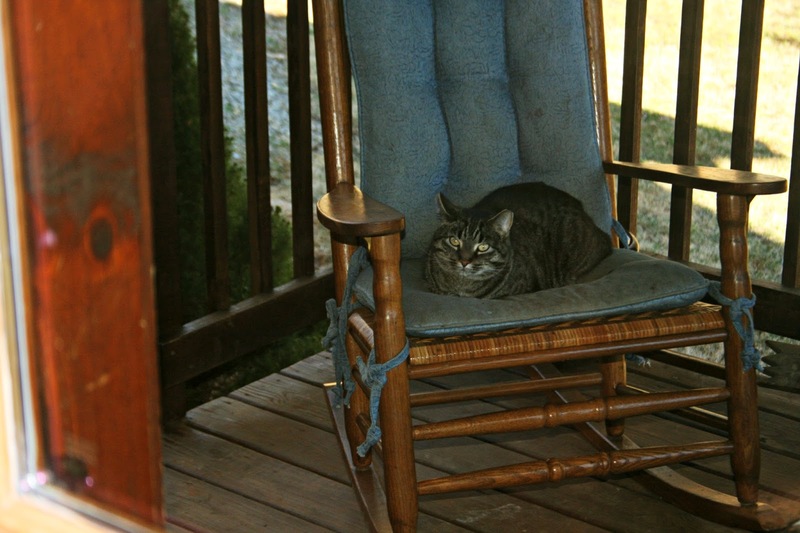 Now, instead of hunting mice all day like he used to do, he sits in the rocking chair on the porch like a little Granny Cat. 2. I don't eat cereal for breakfast. I've never really liked it, probably because I don't really like milk. But the boys do, and Paul does. We go through so much cereal in a week. 3. I like toast for breakfast, particularly cinnamon toast on my homemade bread. It holds me over fairly well, too. 4. I used to love oatmeal for breakfast, but somehow I burned myself out on it. Now I don't really like oatmeal either. 5. We got 5 inches of snow on Tuesday. Luckily, it was too warm for it to stick to the roads. But I'm wondering when we'll stop getting snow/ice weekly? Linked with A Rural Journal. Your chair calls all to sit on him. It looks beautiful with a good cushion. Not only people animals to like to take rest on it! I used to drink milk until I moved here and saw how some of the farmers make it. I like the 5 minute oatmeal but rarely get motivated to make it before dawn when I should be sleeping. The instant stuff should be called oat cereal or something as it isn't oatmeal. I used to like my morning oatmeal with yogurt, but then one day I got sick after breakfast. Ruined both flavors for me. Looks like a comfy rocker. geweldig ,heeft ze ook haar eigen stoel? I think after this long winter, I'd just sit on my chair on the porch too, if I could! :) The mice can wait! I grew up eating a lot of cinnamon toast for breakfast, and I can remember getting home from school and having more cinnamon toast. I still enjoy it and have it now and then. Cinnamon toast sounds great and since it is breakfast time I think I shall make some right this minute ~ thanks for the suggestion ! Willie and his throne are now certainly the king of your property. And, I have already declared my love of cereal--but cinnamon toast is good too. Comfy kitty! lol. We woke up to everything covered in white again this morning along with 17 degrees to accompany it...where is spring? As for oatmeal, I eat Bob's Redmill Oats every morning. But it takes about 20 minutes to cook it. When this bag runs out, I'll switch back to Coach's Oats, which takes about 5 minutes. The trouble is, it's only found in Costco, and we don't have a Costco card. The nearest Costco is 250 miles away. Funny cat. My kittens always sit on my belly every time I'm laying on the rug or mattres. My family can really go through the cereal. They eat it for snacks. I am not a big breakfast person. I like eggs/toast best. Hi there, We are back from ANOTHER trip. This time we were in Georgia checking out yet another waterfall... Check my blog today when you get a chance. I am not an oatmeal eater much these days either.. I used to like it... AND--I'm not much of a cereal eater now either... My breakfast is usually some plain yogurt covered with strawberries, banana and blueberries..
Have a great weekend. Hopefully, Spring is ALMOST here to stay. I'm really hoping that April gets a little warmer. I'm sooooo tired of my winter clothes. He probably is protecting the chair from moving again. And cereal is very popular with our kids too. I eat yogurt for breakfast. Sometimes I eat cold cereal or oatmeal, but not often. Milk doesn't agree with me, but I use soy milk if I eat cereal. That is a sweet photo of Willie! I'm not much of a cereal eater and oatmeal is okay but it is easier to put it into a smoothie in the morning. So where is your Spring??? Granny Cat found his spot! I am so tired of snow and cold. I wish spring would get here already.Lol,I am counting the day until I can plant my garden. This is so funny! I showed Phil and we laughed. If he gains weight, the chair will need to be moved back inside. I am now hooked on Special K bars. BUT am also on a radical diet and have lost 30 pounds so far!! Maybe by the time we meet I will be skinny! I mix it up for breakfast, so I guess I never get sick of anything that way. Usually I have oatmeal for breakfast. With yogurt. And an orange. From time to time, I have something different, like eggs and bacon. Cinnamon toast with home mead bread sounds awesome! We got some snow this week, too. But by Monday the temperature is supposed to be above freezing. Then we'll see what happens. We only had 2 inches of snow Tuesday and like you said, it melted quickly. Mommy does not like milk either,, so no cereal for her,. And mommy like cinnamon like you do on toast!! And we wish we had some home made bread like you have! Looks like the perfect kitty place! I'm a toast and peanut butter girl myself. Happy weekend! We have much fun, cat walkies in the snow. I'm happy that it is starting to melt! I don't like cereal or cream of wheat, or oatmeal. I do like bacon and eggs, and country ham. Your cat looks very content. Cinnamon toast made with homemade bread sounds wonderful. I am a breakfast lady for sure. I like my cup of tea with milk, plus toast with cream cheese on. Your granny cat looks fabulous on the rocking chair out in the porch. Great photo, Lisa! My Mimmo used to look like your granny cat. My Mimmo crossed the Rainbow Bridge when he was 9 in 2011. He took a piece of my heart with him. I still miss him dearly. I used to live with 10 cats at home. Now, I've got only 3. Thank you in advance, Lisa! We go through an insane amount of cereal, and I don't even eat any of it. Just wait until your boys become teenagers. The appetite grows exponentially, just like the kid. I don't drink milk either and my youngest took that from me. I do put in cereal in my yogurt from time to time. i used to love cereal but rarely eat it anymore but we go through a lot too..the boys and ash eat it any time of day, breakfast or a snack. lol, i love granny cat! I try to alternate the healthy cereals like Granola, flavored Oat Meal, scrambled eggs. It is a challenge for sure!